Important Civil War Era map illustrating the Battle of Forts Jackson and St. Philip. Sketch II Showing the Progress of the Survey in Section No. VIII. An unusual and attractive 1862 Civil War era U.S. Coast Survey map of the Gulf Coast from the Delta of the Mississippi to Mobile Bay and Fort Jackson. The primary map, appearing in the right hand quadrants, is an early triangulation chart of the Lake George, Mississippi Sound, Mobile Bay, and Mississippi River Delta Region. 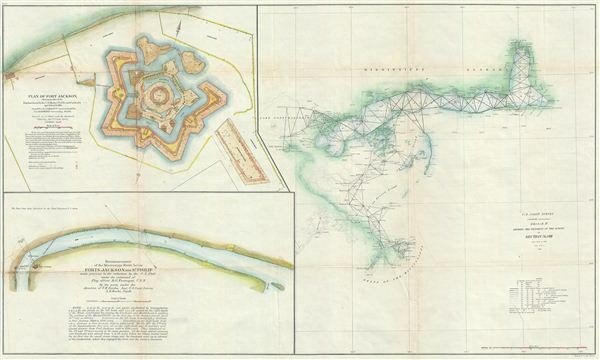 An inset focuses on Fort Jackson with a third inset detailing the vicinity of Fort Jackson and the course of the Mississippi River. These elements were added to illustrate the Battle of Forts Jackson and St. Philip, fought early in the American Civil War, April 16 - 28, 1862. The fort, build to control the primary entrance to the vital Mississippi River artery, was initially controlled by the Confederate Army. Union Navy Flag Officer David Farragut bombarded the fort, distracting its defenders while he sailed onward to capture New Orleans. The Confederate defenders at Fort Jackson surrendered to Farragut after a mutiny in the ranks demoralized defense. Today the fort is a Historic National Landmark and more recently was used to treat oily birds in the early weeks of the Deepwater Horizon oil spill. This map is exceptionally scarce, having been printed only for the 1862 edition of the Superintendent's Report and subsequently abandoned as interest in the war refocused to more active theaters. Nevertheless, it was significant at the time it was issued. The predominantly Union Coast Survey teams produced superior reconnaissance allowing the Union Navy to dominate the Mississippi River and the Gulf Coast. The charts were produced by the Coast Survey's resident Gulf expert, F. H. Gerdes under the supervision of A. D. Bache, Superintendent of the Survey of the Coast of the United States and one of the most influential American cartographers of the 19th century.